A great deal of attention to planning of one’s ocean cruise vacation often goes to the port days – the excursion(s) or not, and if so, which ones, the clothes and items to pack, and so on. Dining options are often way down the list. 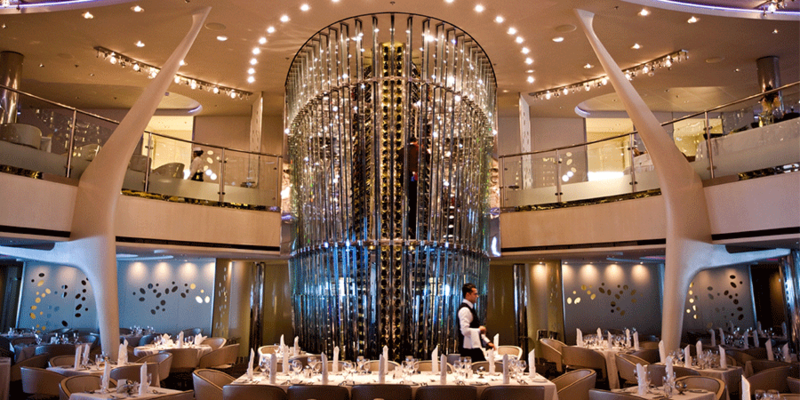 But choosing when and how you will dine can either enhance your cruise or cause you undue stress. Choose thoughtfully to make your cruise a success. Generally, these days most, but not all, cruise lines offer three main options when it comes to evening dining on board: The Main dining room fixed seatings, flexible seatings, and specialty restaurants. The first two are included in your fare, but specialty dining usually means an extra charge unless you are on an all-inclusive luxury line. The fixed seating option gives you a choice of early or late dining, the time frame varies from line to line but allows you to catch one of the shows put on nightly in the theatre if you wish. Do you like to rest after your busy day outings and before dinner? Or do you like to dine early and have the rest of the evening to go to the theatre and “party” uninterrupted? No need to decide when, where, or whom. Dinner commences at the same time each night, you sit at the same table, and have the same dinner companions depending on your table size. You can also choose to have a table for two. Having the same serving staff each night leads to anticipation of your needs. The sommelier often has your favorite wine in his/her hand before you ask. If you have a dietary restriction, your server knows. And you develop a relationship with these hard-working staff. If you have chosen a table (of 4, 6 or 8), you also develop a relationship with the other cruisers who may be strangers in the beginning but can become friends by the end of the cruise. It can be a wonderful way to expand your horizons, from tales told of life at home but also of the experiences on ship and ashore each day. What if you don’t like your tablemates? You can always ask the maitre’d if you can be moved to another table. Usually this request can be accommodated. If you are a cruiser that has always opted for fixed but are curious about flexible, remember that breakfast and lunch in the Main dining room is often an option on many lines, and during these times it is always “flexible’. Try it out instead of the buffet to see if you like it. You can decide when to eat based on your daily activities with no rigid time table. Your dining time bends to the varied excursions or other activities planned. Except for those lines that may require reservations, you show up within a certain time frame for dinner, are seated, and often share a table with others unless you specifically wish a table for two. Because you do not have the same tablemates each night, you meet more people. If you do not wish to ever eat with these folks again, no worries, as the next evening meal it will be someone new. There are a few downsides to flexible dining which may not be of any great concern depending on your situation. Because your wait staff may be different each meal, you will have to explain your requirements, or likes/dislikes each time. And depending on the time you show up to eat, you may have to wait, unless of course you made reservations which rather diminishes the idea of total flexibility. Note: one popular cruise line that has only flexible dining (and specialty for a price) is Norwegian and they call it “Free Style”. Specialty dining gives you the option of having different dining experiences, if you don’t mind paying extra (except for all-inclusive lines). Not all cruise lines have these culinary options, but they are certainly tempting: Asian, Italian, Seafood, French, Steakhouse, and more. Some have dining experiences such as Chef’s tables where the food is prepared in front of you. Others have popular shoreside restaurants on board. Some long-time cruisers complain that since the advent of these specialty restaurants, the cuisine and service in the main dining rooms have gone down a notch to encourage dining in the extra-charge venues. Regardless of whether you agree or not ( and this writer does), unless you are eating in a different specialty restaurant every night of your cruise, you still have to choose between fixed and flexible dining. So, in the pursuit of your next cruise if your dining experience forms a good part of your enjoyment, you should consider the dining options offered by each cruise line as well as the itinerary and fares. What has been touched on here is just a general guideline as each cruise line has its own version of dining choices. This is where your travel professional’s advice and knowledge are invaluable. Article originally appeared in Real Travel Experts. Feature image courtesy of Pixabay. Share With Friends & Relatives! Should I travel with a Group?